How to Claim your Won/License? | Promo2day How to Claim your Won/License? How to Claim your Won/License? This is a tutorial on how to claim your won/license if you are one of our lucky winners. First, if you are interested in the software giveaway and need a license then please visit again to see if you won or not. Third: If you didn't respond within this time frame and NO PM is sent to the giveaway organizer, your won will be void and go to another user. You claim only once with the required details. No need to ask many times about your license win. 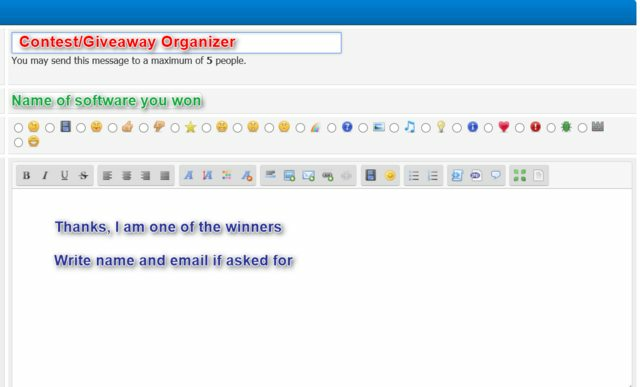 To claim your license; you must send "Private Message" to the giveaway organizer. Simply click PM Button (present below the post) or open the member profile and use send private message. In the message form that will open; fill the required details then send. Thanks for posting this Tarek as many members pm me a request for their win and I have no idea what licenses they are claiming. Many many thanks .. bookmark this thread. Thanks For Your Magic Touch ; i always suffer from repeated claim. Thankyou for this great tip.i will chech outbox nexttime.